Fellowship Previews: Hillary Clinton Joins Valiant's High-Flying Heroine for FAITH #5 – A History-Making Election Milestone Coming in November! Hillary Clinton Joins Valiant's High-Flying Heroine for FAITH #5 – A History-Making Election Milestone Coming in November! 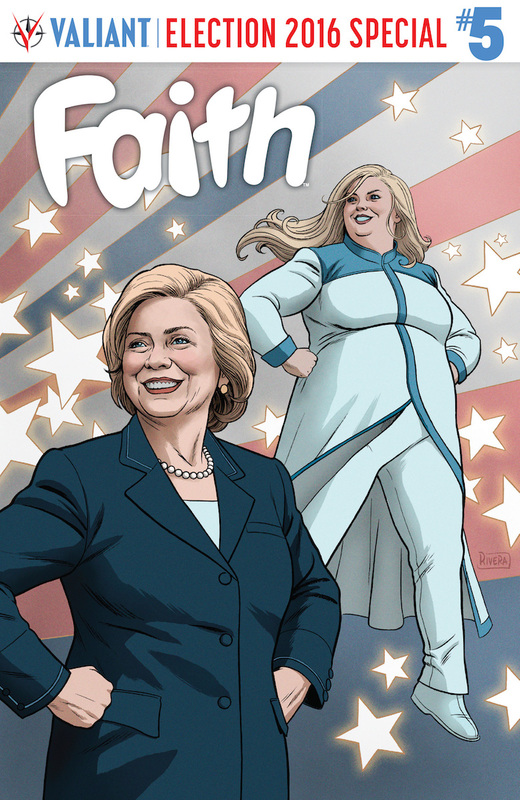 In advance of San Diego Comic-Con 2016, Valiant is proud to announce that Hillary Clinton, the Democratic Party's presumptive nominee for President of the United States, will join forces with Faith "Zephyr" Herbert on November 2nd in FAITH #5 – a history-making, 48-page election special teaming the leading female hero in comics today with the first female nominee from a major political party for a special tale written by comics legend Louise Simonson with art by FAITH's own Pere Perez! On November 2nd, just days before Election Day 2016, legendary writer Louise Simonson and Harvey Award-nominated artist Pere Perez present history in the making with a presidential milestone like no other! Faith Herbert, star of the highest selling independent superhero debut of 2016, is a shining beacon of optimism in a challenging world. Her day job as a blogger and journalist is about to bring Faith face to face with Democratic Presidential nominee Hillary Clinton…but it's her daring alter ego as Los Angeles' leading superhero that will have to save the day when a new threat emerges to imperil a pivotal moment that has all of America watching! "There is no other character in comics quite like Faith, and it's no surprise that she has captured imaginations worldwide to become the leading superhero of 2016," said Valiant Publisher Fred Pierce. "Valiant's mission has always been to reflect the reality around us through the lens of comic book storytelling. Faith is the perfect embodiment of a comic book character that dares to defy the traditional norms of who or what a hero can be. That's a message that can resonate with anyone, anywhere, at any time and has taken on even greater significance as America prepares for a historic election this November." Plus, also coming in the oversized, 48-page FAITH #5 election special: Faith's adventures continue with an all-new lead story by the ongoing creative team of writer Jody Houser (Orphan Black) and new series artists Meghan Hetrick (Red Thorn) and Marguerite Sauvage (DC Comics Bombshells), as well an exclusive prelude to HARBINGER RENEGADES #1 – featuring the long-awaited return of Faith's beloved superteam – by writer Rafer Roberts (A&A: THE ADVENTURES OF ARCHER & ARMSTRONG) and Eisner Award-winning artist Colleen Doran (The Sandman)! With covers by Eisner Award-winning superstar Paolo Rivera (THE VALIANT, Daredevil), Harvey Award nominee Clayton Henry (SAVAGE), new ongoing FAITH interior artist Meghan Hetrick(Uncanny Avengers), and more, join an all-star cast of Valiant's greatest talents on November 2nd inFAITH #5 as the leading heroine in comics today joins forces with Hillary Clinton for a landmark comics event! Created by former Marvel Editor-in-Chief Jim Shooter (Secret Wars) and Eisner Award-winning writer and artist David Lapham (Stray Bullets) in Valiant’s acclaimed HARBINGER series in 1992, Faith has long been a central icon of Valiant’s award-winning publishing line. Then, in January 2016, Faith took her long-awaited, much-demanded first step toward solo stardom with FAITH #1 (of 4) – a groundbreaking debut that quickly became the first and biggest breakout hit of the New Year from any major comics publisher. In the months since, Faith’s first solo adventure has garnered near-universal critical acclaim; generated attention from a host of international media outlets, including The Atlantic, The A.V. Club, Cosmopolitan, The Guardian, The Hollywood Reporter, The Huffington Post, The Independent, MTV, The New York Times, NPR, PBS Newshour, People, Seventeen, Today, Vox, The Washington Post, and dozens more; and become the first series of 2016 to reach a much-vaunted fifth printing – making it one of only a handful of hit series in the past decade to achieve that pivotal benchmark of fan and commercial demand. Faith's unprecedented streak of history-making achievements continues this Wednesday, July 20th with the release of her first ongoing series in the all-new FAITH #1 – a first issue that has already rocketed onward to become the highest selling superhero debut of the year from any independent publisher in the industry today. An award-winning writer and editor with more than 40 years of experience, Louise Simonson is one of the most respected and tenured female creators in comics history. With lengthy and acclaimed runs on some of comics' most influential series, including New Mutants, Superman: The Man of Steel, and X-Factor, Simonson has co-created a host of enduring characters, including Apocalypse, Cable, and Power Pack for Marvel Entertainment and Doomsday and Steel for DC Entertainment. FAITH #5 will be her first work for Valiant Entertainment. For more information, visit Valiant on Facebook, Twitter, Tumblr, Instagram, and ValiantUniverse.com. For Valiant merchandise and more, visit ValiantStore.com.